April 20, 2010 -- Campus landscape architect William Hall has provided this graphic image of where trees will be planted in honor of Earth Day 2010. 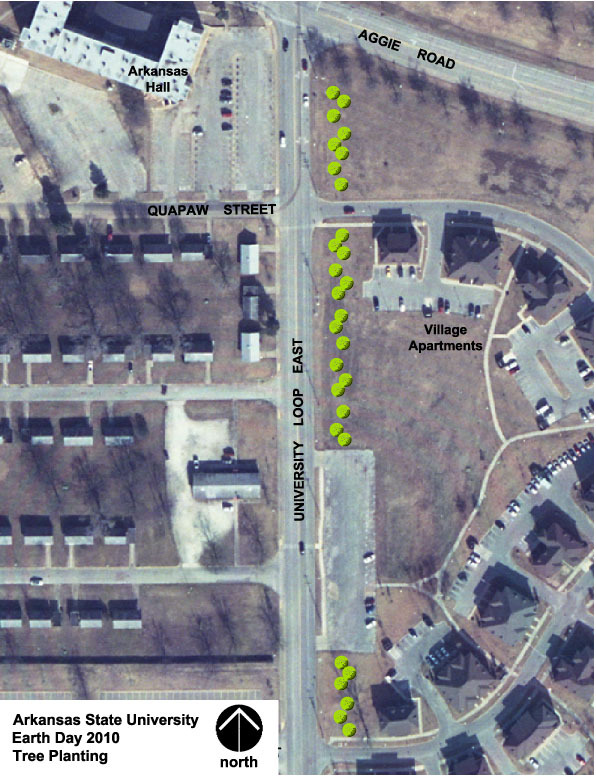 As during last year’s Earth Day celebration, tree-planting sponsorship is available on the east side of University Loop East and south of Aggie Road. Trees are presented for a $150 donation and include a deciduous mixture combined with a few flowering focal trees. The donation includes the tree, planting and mulch, and recognition on the Earth Day plaque that will be constructed on the site. Because the site is remote from the celebration area, the physical planting of the trees is not a part of the ceremonies. Colleges, departments and organizations are invited to donate a tree, as well as any individual or group who would like to contribute to Earth Day and/or provide a living memorial. For details, contact Dr. Bouldin at ext. 2570, or see the NewsPage release on the 2010 Earth Day celebration.